The Casa Aztlan mural, created in the 1970s by artist Ray Patlan, was painted over by a developer in Pilsen earlier this month. PILSEN — After an iconic mural was painted over in Pilsen earlier this month, the developer responsible for the change has promised to bring back the mural's original artist to re-create it. 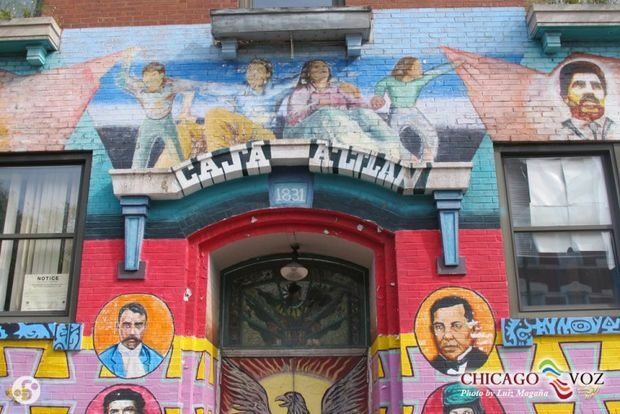 Workers painted over the mural that adorned the former Casa Aztlan community center facade at 1831 S. Racine Ave., a storied artwork created by artist Ray Patlan and Pilsen students more than 45 years ago. The incident sparked outrage in the neighborhood known for its public art and murals. Developer Andrew Ahitow of City Pads said that he will bring Patlan back to Pilsen to re-create the mural on the wall, or to create a new mural for the building. Patlan, now 71, moved to Oakland, Calif., in 1975 to pursue a job teaching art at the the University of California at Berkley and has been living there ever since. City Pads is working to build 10 four-bedroom apartments at the site, and the project is expected to be completed in the next three months. Ahitow declined to say how much the units would rent for. If all goes well, Ahitow said he would like Patlan to come back to work on the mural soon, and they are working to coordinate schedules. 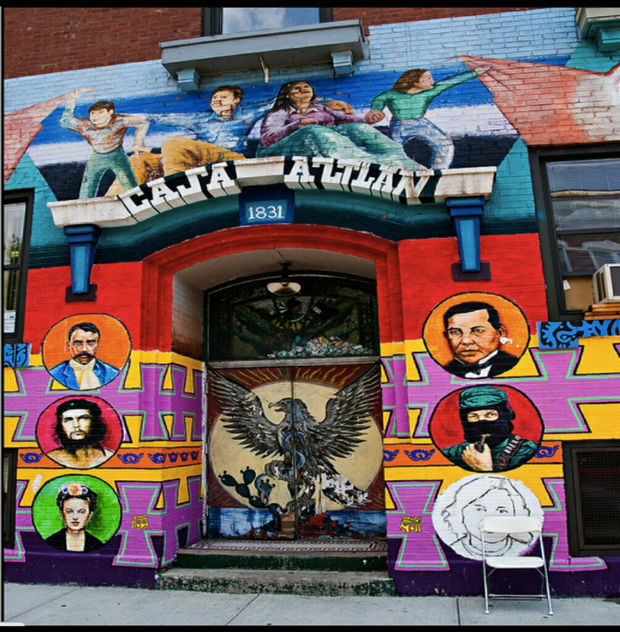 On Tuesday, Patlan confirmed he plans to return to the neighborhood to re-create the Casa Aztlan mural or create a new work of art at the former community center. Whether it's a new mural or a re-creation of the old piece is entirely up to the community, the artist said. "I'm willing to do it, and he's willing to put up whatever to make it happen," Patlan said of the developer. "I thought it was good PR for him." Patlan, born in Mother Cabrini Memorial Hospital in 1946, was raised in Pilsen by his parents, who immigrated to the United States from Guanajuato, Mexico, with his four sisters. He says he learned from relatives who still live in the area and other artist friends that the mural would be painted over. "I felt bad, of course. It goes back some 40 years for me," Patlan said, recalling the hot summer that he and young people from the neighborhood "worked like hell on it." "I knew the community was not going to be happy about it — that place is like an institution in the community," Patlan said. "At the same time, I realize that everything changes. But I'm glad the community took up the struggle." Patlan, a Vietnam veteran, said he got the idea to create murals inside Casa Aztlan when he was returning home from the military in the early 1970s. Casa Aztlan was "a second home" for him; he had been going there since he was 10, he remembered. "I saw that a lot of the plaques and dedications [in the community] were to European people, which made sense, because Pilsen was a Bohemian community for many years," Patlan said. "But the community changed, and I asked if I could do some murals on the inside walls." Officials agreed — if he bought the paint himself. "I did the whole inside," Patlan said. The interior murals showed the history of Mexico, he said. The next summer, Patlan enlisted help from area youths to help create the external mural, which features depictions of famed Mexican artist Frida Kahlo and Chicago labor activist and community organizer Rudy Lozano, among others. It is his hope to bring back the people who worked on the original mural to help create the new artwork. Over the years, other muralists, including artists Marcos Raya, Salvador Vega and Robert Valadez, have helped maintain the mural, according to a Tribune report. Byron Sigcho, executive director of Pilsen Alliance, said painting over the historic murals was a symbolic gesture that represented the erasure, or "whitewashing," of Pilsen's history and identity as a Mexican-American neighborhood. The mural was painted over as a number of residents grow increasingly concerned they are getting priced out of Pilsen, a historic port of entry for Mexican immigrants. 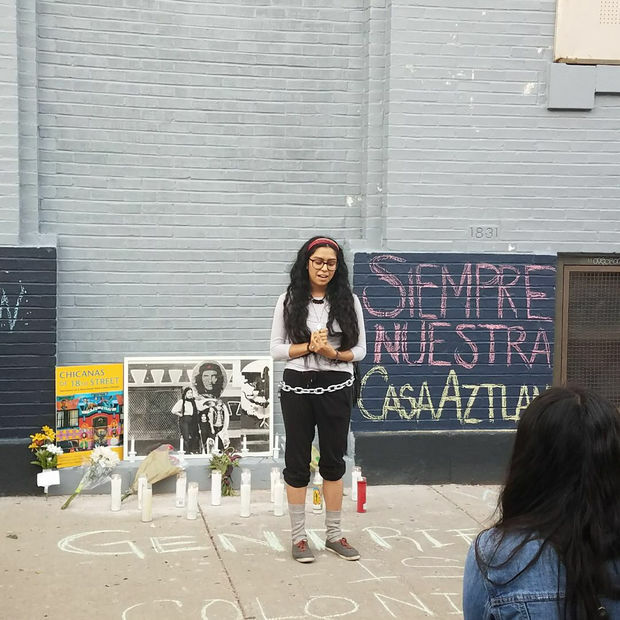 To mourn the loss of the mural, the Pilsen group hosted a vigil earlier this month and a discussion on the future of the site this week. "The destruction of these murals is a real community tragedy and very telling of the times we are living in our community," Sigcho said. 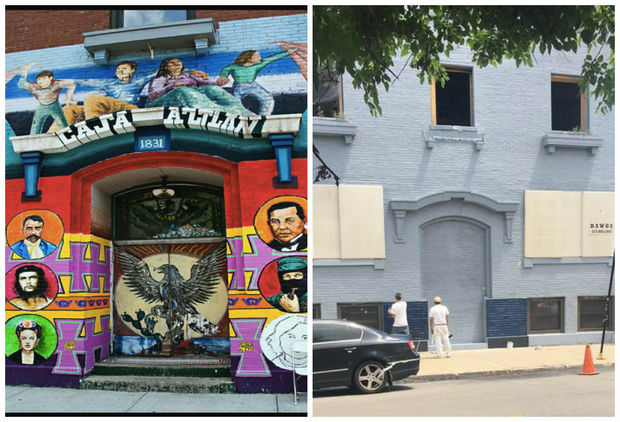 The loss of the murals is just one concern of residents. Some neighbors also want the developer to commit some of the building's apartments to affordable housing, "especially given the significance of the site," Sigcho said. "We want to hear from the developer. How can we come together and [broker] a compromise between him and the community?" Sigcho asked.